Sam Weller's Bookstore and Slug Magazine have been ultra proud of bookseller Zach Sampinos' Hardboiled Bookclub! Check out his interview with KUTV's Gavin on Gavin's Underground Blog: here. Tonight the Hardboiled Bookclub will be meeting yet again at 7 pm down in Weller's Basement, this time to discuss, The New York Trilogy by Paul Auster. Zach comes prepared to lead an edgy discussion, lay out a bed of small treats, and listen to your spin on the story. If you can't come this month join us next month on August 26th to discuss Half Life by Shelley Jackson. What if you were born old and grew younger? This is the question in "The Curious Case of Benjamin Button", a short story by F. Scott Fitzgerald. In this story, Benjamin Button is born to Mr. and Mrs. Roger Button in 1860 an old man of around seventy with wispy white hair and a long smoke-colored beard able to ask Mr. Roger Button if he was his father on the day of his birth. By the time he's eighteen, Benjamin Button looks to be around fifty, and this continues throughout his life that those around him, his family, his wife, would look older as he regressed in age. This story is full of magic and composed so brilliantly that it has been published in multiple collections of short stories by Fitzgerald and even as its own stand-alone book (the perfect size to take with you on a car or plane ride and keep you entertained until you reach your destination). This fall, "The Curious Case of Benjamin Button" can be seen in theatres. An adaptation written by Eric Roth (writer of "Munich" and "The Good Shepherd") and directed by David Fincher (director of "Se7en", "Fight Club", and "Zodiac"), it stars Brad Pitt as Benjamin Button along side an amazing cast including Cate Blanchett and Tilda Swinton. Take note, this looks to be an Oscar contender, the trailer alone gave me chills. If you want something short, or different, or something with characters you can actually care about, I highly recommend picking up a copy of "The Curious Case of Benjamin Button", you won't regret it! *And make sure to read this before you see the film, no excuses, the stand-alone book is barely 52 pages long. 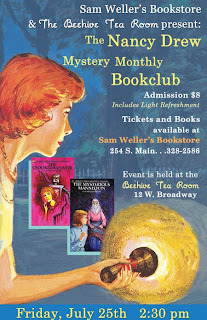 For almost two years now Sam Weller's Bookstore and The Beehive Tea Room have worked together to host the Nancy Drew Club. Each month our facilitator, Courtney Martin leads an exciting discussion and is always at the ready with little known Nancy Drew trivia! This months club will be held on Friday, July 25th at 2:30 pm at the Beehive Tea Room--12 W. Broadway, SLC. Tickets must be purchased in advance at Sam Weller's Bookstore--254 South Main Street, SLC. This months book selections are: The Mysterious Mannequin and The Crooked Bannister. Your ticket includes the most delightful delectables from the Beehive Tea Room including tea and scones. 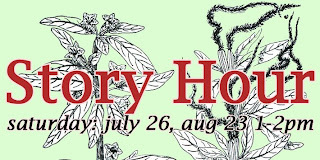 Join us for Em's Sprout House Storybook Hour at the Red Butte Gardens this Saturday, July 26th 1-2pm. 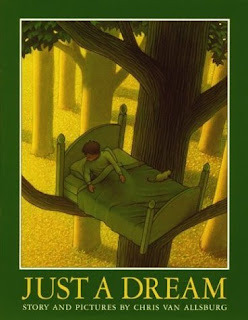 Our Stephanie will be reading the classic picture book Just a Dream by Chris Van Allsburg. Regular garden admission for adults and kids will get you in, so make an afternoon adventure of it in the gardens. For children ages 3-6, must be accompanied by caretaker. Story time will be followed by storybook-themed activities. What we're really looking for is a conversation. With you. 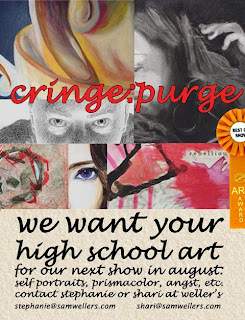 we want your best/worst PAST high school art for our next show in august: this is a retrospective of all of our most intense works, sophomoric prismacolor attempts, social commentary paintings and collages, self-portraits and celebrity renderings, first-time welding projects, angst-driven expressions, unintentionally weird pastel still lifes, paintings of that wooden model thing, our AP art portfolios, etc. entries are due by saturday, august 9th. please contact stephanie (stephanie@samwellers.com) or shari (shari@samwellers.com): you can email images or bring them to the store. the exhibition is part of a CRINGE open-mic event in september, so stay tuned for details on that as well. .
Sam Weller's Gallery on the Mezzanine exhibits noteworthy and diverse artists and group shows. Past shows include the MAP embodied, a mixed group show featuring vintage geological maps and map-inspired paintings and collages; News From Nowhere, an installation in which recent east-coast import Richard Zimmerman examined the psychogeography of the west through site-oriented artist books and a series of collageworks. Please check out our albums of these exhibitions and stay perched for our new art shows and events. 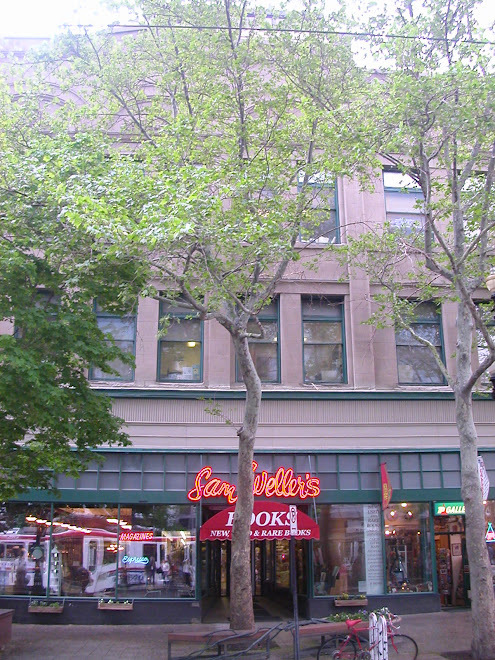 Welcome to Sam Weller's Bookstore's official blog! Stay tuned for updates on events, bookclubs, book reviews, and anything else worthy of note in our establishment.